The Stephanie is 43 feet in length and 15 feet wide in the stern. This is where everyone wants to fish! There is a large galley with coffee maker, toaster, microwave oven, gas stove, electric frying pan, complete with pots, pans, and cooking utensils. The Stephanie has full shade with rod racks and lights overhead. A large bathroom and shower, and six bunks down below the bow deck. The dinette table seats six comfortably. All boats carry adequate fresh water for showers, and guests are encouraged to bathe after a long day of fishing or other activity. Andy has been fishing Key West, the Marquesas Keys and the Dry Tortugas for more than 25 years. Dry Tortugas fishing trips have become popular among avid fisherman and families who want a different type of Florida Vacation. 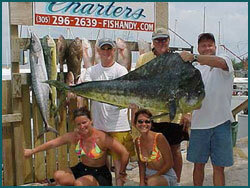 Andy Griffiths Charters offers 2-day and 3-day Fishing Charters from Key West to the Dry Tortugas National Park. Andy uses the Dry Tortugas islands as our central location but fish a distance from the Ft. Jefferson area on patch coral reefs and wrecks. Fishing in the Dry Tortugas yields many species of fish including Mutton Snapper, Yellowtail Snapper, Mangrove Snapper, Grouper, Cobia, Amberjack, Kingfish, Sharks and Barracudas. On his way to Ft. Jefferson Andy may choose to troll baits for awhile for Mahi Mahi, Sailfish, Wahoo and Tuna. Located only 4.5 miles from old town Key West and only one mile from the city limits. Stay Andy’s Key West Vacation Rentals are just off the beaten path. Stock Island is truly a last little piece of old Key West. Stay in a vacation rental on a real working waterfront, alongside a local restaurant known for their exceptional seafood. The location is ideal for quick trips or exploring the island of Key West. The rentals are just a short trip from Duval, though many people choose to just kick back and relax. That's 3 years in a row! Capt Eddie Griffiths has taken over the family business of 50 years and has taken it to a whole new level with his state-of-the-art first class charter boat with all the comforts of home. Along with only the best Garmin products, such as his dual 7212 chart plotters, radar, auto pilot and chip technology fathometer, to find the fish fast. The Capt. Andy was just re-powered with a brand new 3406e 800 hp cat engine and transmission and propeller to get you on the fishing grounds faster than ever before, which will increase your fishing time and your catch along with a smoother ride with the brand new pair of Lenco trim tabs. Capt. Steve owns the fastest boat and is the most experienced Scuba Diving/Fishing combination charter company offering Dry Tortugas trips in the Keys, where his family has been making a living for 5 generations. Check this one out for combination trips of fishing and/or SCUBA diving! Capt. James' first job was fishing on a boat. He got his captain's license immediately after turning 18 and at that point had more experience than most fishermen three times his age. All former Captains of Andy Griffiths Charters are independent owner/operators. This site is maintained by CindyJefferson.com | Design by CindyJefferson.com.